IN MOW VISTA BONITA WE LIKE TO TALK ABOUT “THE MOW EFFECT”. THIS IS AN EMOTION YOU CAN FEEL FROM THE VERY BEGINNING OF YOUR STAY. IT IS A MIXTURE OF GOOD ATMOSPHERE AND QUALITY SERVICES TO LET YOU FLOW. 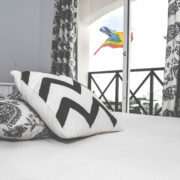 You can choose among the 20 spacious and luminous duplex, all of them overlooking the swimming-pool and garden. A two-floored duplex (55 square metres each), with a terrace overlooking the swimming-pool on the ground floor and a balcony with a view on the second floor. There is a living-room, a bathroom and fully equipped kitchen (with small electrical appliances). 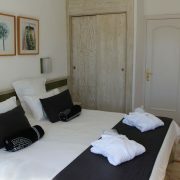 The private double bedroom is on the second floor with a second bathroom (ensuite). Offering the same comforts as the standard duplex, the deluxe duplex overlooks the swimming-pool, it has a balcony with a view to the garden,an independent kitchen and a living-room, two bathrooms and a spacious double bedroom. Its surface covers 55 square metres and it’s air-conditioned. 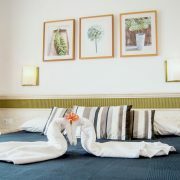 It also offers toiletries, a bath robe, slippers, a 42’’ Smart TV, iPod support, a safe box, a pillow menu and a welcoming gift. 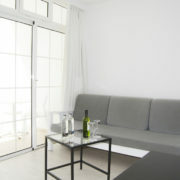 This apartment’s surface covers 40 square metres with an independent bedroom and a balcony with a view to the dunes. 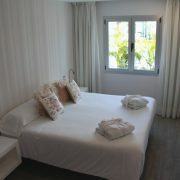 It has a living-room and a fully equipped kitchen (with small electrical appliances), a private bathroom with toiletries, a flat screen TV and air-conditioning.